"I love the sheer ambition of What Ever. To describe our entire country through a dozen major characters and maybe a hundred minor ones...It is one of the greatest works you've never heard of." now a play for multiple actors!! WHAT EVER is a 100-character epic serial performance performed by one actor, in 8 installments. It follows 10 main characters across America as they intersect with over 90 others and their lives and stories converge. "WHAT EVER" is the result of a dare. A friend challenged Heather to write and perform a new show every week for a year. She modified the length to a pregnant nine months and took up the challenge in September of 1994. For thirty-seven consecutive weeks she wrote and performed a new half-hour of "THE HEATHER WOODBURY REPORT" in the back of an East Village bar. As characters and plot line developed, audience became mid-wife and the "performance novel" was born. The long addictive yarn she spun was shortened and tightened by director Dudley Saunders (the guy who dared her!) and "What Ever: An American Odyssey in Eight Acts", directed by Saunders, premiered two weeks later at P.S.122 in June of 1995. It went on to tour internationally as a critically acclaimed epic (8 part) solo play -from Chicago's Steppenwolf to London's Royal Festival Hall. The new form went on to gather acclaim as a groundbreaking invention, which stretches the boundaries of contemporary theatre even as it echoes the origins of literature in the oral tradition. As a radio-play, WHAT EVER was hosted by Ira Glass, featured on PRI's "This American Life", and broadcast on NPR affiliates in Chicago, Seattle, Albuquerque and Boston. What Ever is now published as "a living novel " by Faber/Farrar, Straus & Giroux. This edition is also being utilized as a script for productions with multiple actors> and as a teaching text at colleges and universities. Linda Frye - Skeeter's mother, Jeanette's sister. A Wicca witch of the North Coast, embittered by the desertion of Skeeter's dad Bruce Frye, a pot smuggler. Over 100 others too numerous to mention. This comedic epic (8-part, 10-hour, 100 characters) orbits around ten main characters from across the country whose lives ultimately intertwine. From 85-year old Violet, an Upper East Side bohemian struggling with mortality, to chemical executive Paul, grappling with a crisis of conscience, to his stifled Southern housewife Polly and his brittle Manhattan mistress Jeanette, both searching for release, to Hell's Kitchen whore Bushie, dodging destruction with her naked wits, the story spins from coast to coast, bound together by the chance meeting of three West Coast "ravers"- Clove, Sable and Skeeter -whose adolescent quests begin and end at a fateful Rave. "The story unfolds over nine months in 1994 and 1995. Woodbury's Odysseus is Skeeter, a sixteen year old boy who hitch-hikes across the U.S from his home in Portland, Oregon, first to visit his father in federal prison, then to land on his Aunt Jeanette in New York." "The core cast of characters clusters around two groups. There are Skeeter's family and friends: among them the California "rave babes" Clove and Sable, to whom he has jointly pledged his everlasting love. His aunt Jeanette, call-girl turned crystal healer is the hinge that links this group into the second cluster, her lover Paul, a 68-year old corporate high-flyer and his Virginia family: his Southern Belle wife, Polly, who has embarked on a passionate affair with a black man, and their tree-hugging daughter Sheila." 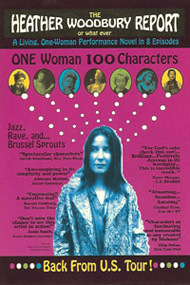 1996-1999 What Ever: An American Odyssey In 8 Acts 10- hour, 100-character solo play/"performance novel", directed by Dudley Saunders. 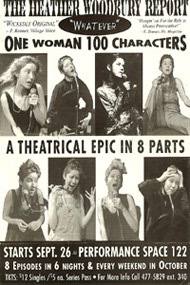 The complete 8-act cycle performed a total of 41 times, in the course of 7 showcase /workshop productions and 10 full productions. 1997 Oct "This American Life," hosted by Ira Glass. 1997 Commission from Kavanagh Fund, a private fund in Austin, Texas, to record complete "radio-play' of What Ever in a studio production. 1995 $5000 Commission from Lila Wallace Reader's Digest Fund and Joyce-Mertz Gilmore Fund through P.S.122, NYC to abridge and mold What Ever: An American Odyssey in 8 Acts from the 20 hours of material created during the 9-month writing and performing laboratory known as The Heather Woodbury Report. 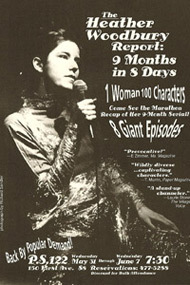 -1995 May The Heather Woodbury Report A 9-month dare, to write and perform a weekly episode for 37 weeks in the back of a NYC bar. I began with very little idea of what was to come except for the germs of certain characters, images, and themes. This became an underground phenomenon.